This unusual shaped zucchini squash produces a generous crop with a delicious flavor. Can be used fresh in salads or cooked in any zucchini recipe. Because of its shape it is well suited for stuffed zucchini. Compact plants produce round to oblong fruit 1 to 5 inches in diameter. Plants continue to produce tender, vitamin rich fruit until frost if all fruit are picked before they mature. 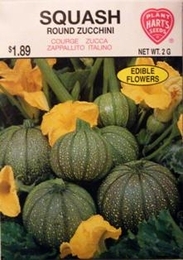 Round Squash are best picked when they are 1 to 5 inches in diameter. Cooked like summer squash, used fresh or fried in butter. Seed spacing - 3-5 seeds in a ring about 2-3 inches across.